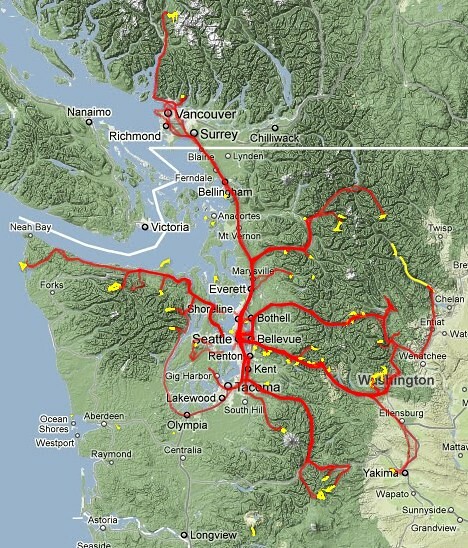 Here’s a map that shows every tracklog I recorded this year, driving and hiking around Washington State (mostly). The red tracks were recorded while driving (or, in one instance, while on a ferry). The yellow tracks were recorded while hiking (or in small boats). I only started recording driving tracklogs end of April, hence the few disconnected hiking tracks on the map. The map was created with Google Fusion Tables, which somehow is smart enough to be able to show a large number of tracklogs all at once. I wrote a small script (in Groovy) to convert a directory containing GPX tracklog files into a single KML file that can be imported into Google Fusion Tables. Click on the image above to open an interactive, zoomable map.